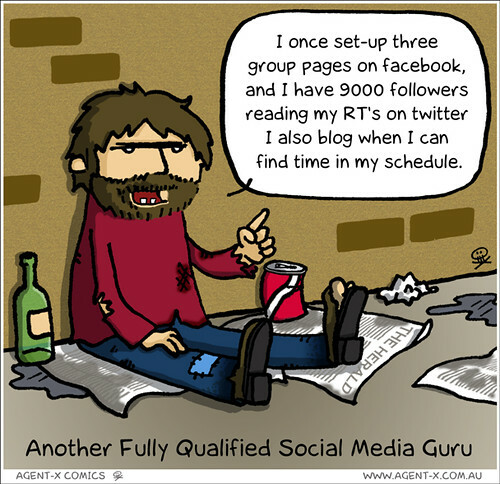 Social Media Guru by Scott Hamson via Flickr. 1. Can you say for certain how to gain new targeted followers on twitter? I’m talking guaranteed results. Can you make a ROI if the only goal is to gain followers on Twitter? Not just any followers either, but targeted followers on a specific subject, or interest? They looked at my rankings on Google, my blog’s SEO data for “There’s a blog in my soup”, and my twitter activity and saw that I knew how to brand myself, and that I’m not just a pretender, or wanna be. You absolutely need to build a presence first, and have visual proof that you can market yourself. Face it – if you can’t market your own brand, your own services, and something that you’re passionate about – how can you expect any company to take you serious? You need to get your own social media house in order, so to speak. 2. Is your blog / business site in the Alexa 1 Million or better club? This goes along with what I said earlier, but before I personally take any action with a company, before I buy from them I check their Alexa rank and I use SEO Quake firefox plugin (now available on Chrome as well) to see if they are a company with at least some presence. Perhaps its the geeky SEO-curious marketer in me, but I like to know that I’m doing business with a company that’s going to be around if I have a problem – if they’re not ranking then chances are they won’t last long. How will you persuade people to trust that you can consult for them, when your own business isn’t ranking like it should? They say to fake it till you make it, and you will need to do that for the first few clients, but you also need to position yourself as an authority before even attempting to get a gig. Getting to the top doesn’t take a lot of effort either. There have been literally a million blog posts on getting traffic. If you’re not getting the traffic, then you need to revisit your own social media presence, before fixing someone else’s. If you’re not ranking then I recommend blogging like a banshee – 3 times a day for a month on your topic, or keyword. After one month you’ll be amazed at where you rank. You’ll also want to be sure to guest blog for other blogs, QuickOnlineTips is probably the best resource to start guest blogging at, they publish hundreds of guest blog posts and they have thousands of readers. Read their guidelines to submitting a guest blogging post and post your first today. Now when it comes to your blogging, and guest blogging you can’t expect to get popular by copying or rehashing popular content. Be unique, add your own slant to social media news. Be humorous, but most importantly be original and relevant. Remember this: “You can’t teach a man to fish, when you’ve only seen it done by other people and haven’t yet done it yourself”. You need to exemplify proper social media optimization skills, and show that you’re fit to lead and teach others. 3. 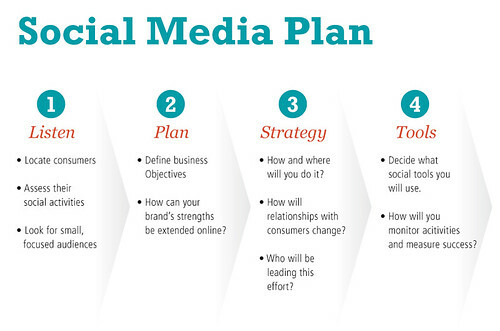 Do you have a standard social media marketing plan, one that is generic and can fit most business models? It’s good to have a place to start, there are some things in social media that are just standard practices. You should have a detailed plan of action for a generic company, covering as many benchmarks as you can dream up. This way you will be prepared for whatever scenario comes your way, or if something comes that you’re not necessarily prepared for, you will have the skills to develop a plan of action. At the basic level, social media consulting is a business in and of itself. It’s a fact that no business can thrive, without a plan of action. Try going to get a business loan without so much as a business plan, and they will turn you away. Why? Because they know that any business without a plan, is guaranteed to fail. There’s no ifs, ands, or buts on this one. No Plan = BIG FAT SOCIAL MEDIA FAIL. Social Media Plan by Chris Wilson via Flickr. “When you fail to plan, you plan to fail” this isn’t some cliche` quote it is very true, and applies to all businesses even consulting. One thing I also like to have along with this is a spread sheet with a list of tools and when to use them for different goals. Some of the tools I use include SocialOomph, SEO Quake (as mentioned earlier), TweetDeck, Disqus, WordPress, and many more; these help when talking one on one with new clients trying to come up with the best strategy for their social media marketing. 4. Are you willing to work for less than you’re worth? Even less than minimum wage sometimes? If you have absolutely no tangible experience in social media consulting, i.e. no references, or employment history, getting started can be a daunting task. I’ve known some consultants who even went so far as offering their services for FREE in exchange for testimonials and references. You may not have to go that far, but you may need to take some gigs that might be better for someone in a country where $5 gets you a lot more than it does in the US. If you look at a lot of the freelancing sites for social media jobs you will find that a lot of the average jobs have bids from people for as low as $2-4 per hour. I’m sure some of these are people from India, and other non-US locations, which does give you an advantage, as your English skills should be better than theirs. Having English as a first language does make a huge difference in branding, we speak differently, you can really tell when someone who doesn’t speak English as a first language, is the author of an article or post. Sure many brands may try to cut corners and think outsourcing yet another job to India makes good sense, but the readers of their blog can tell the difference, and they won’t easily be fooled. For me it was very nerve racking, I knew what I wanted to do. More than anything I wanted to work with new companies, startups, entrepreneurs, developers of new applications, and help them to get their presence online. I tried looking at Mashable’s job listings, and other job listings for social media positions. Many required me to uproot my family and move, and being a new consultant, a part of me felt afraid they might fire me in a week, and I’d be in a city I’m not familiar with, with my family to support, and no job. Some required a Bachelors in Communications, or Marketing – I have neither. It seemed daunting, and I thought to myself I don’t really know 100% that I can deliver what they’re looking for. What if I fail them, I know that I know a lot, I’ve been marketing myself for ages, and running a profitable and successful blog – but is that really enough? According to Jay Deragon many social media job listings you see are actually pretty ridiculous. One thing he brought up was a social media job listing that asked for 5+ years experience in social media – if you have 5+ years then you’re lying. Most social networks haven’t even been around that long, and if you’re one of the early adopters and have a bachelors in PR, then you’re not going to take their entry level job for $40,000 a year. You’re destined for bigger things. This is why you need to have YOUR presence out there and optimized. I was searching for social media jobs, and came across a number of jobs I thought might interest me on a site called Odesk. It’s a freelance site, but has a lot of features for employees and employers. It has tests you can take for different fields, and I want to make this perfectly clear – I’m in no way affiliated with Odesk, and there may be better sites out there but it’s the one that I went to. I did a search for social media jobs, and I applied at all I could find. I started getting people emailing me, and literally saying “Wow, you’re presence is pretty impressive”. Now these companies know that I’m no Brian Solis, Darren Rowse, or Chris Brogan – some of them don’t even know or care who they are, but they aren’t looking for a social media superstar. They’re looking for someone social media savvy – who will do a job for them in their price range. Which I’ll admit isn’t always that great, but each company or person I work for I ask if they will give a testimonial for my consulting business. The biggest hurdle is getting your first client. A lot of it can be traced to your own fears of being inadequate, many of us suffer from the “I’m not as good as…” someone else fear, especially when we’re starting out. The journey of a thousand miles begins with the first step. If you can’t take that step, then you’re destined to remain where you are. Be bold. Be brave. Believe in your abilities. Apply at every social media job on freelancing sites, give them detailed stats on your own brand, let them know your Alexa ranking, how many twitter followers you have, and more. Many may not know what Alexa ranking or Pagerank means – so educate them. Teaching possible clients that you know the terminology, that you know your game is what it means to be successful. When people reply, be honest with them – let them know what you can and can’t do for them. Never make promises that you can’t uphold. One word of advice is don’t just limit yourself to social media when helping these firms, sometimes it’ll come in handy to think outside the box and come up with unique marketing ideas. If it’s a local business why not reach out to local social media clubs and groups, offer them free lunch if it’s a restaurant, or offer them samples of whatever product or service is being offered. These are social media fans, most have a blog, and all share via Facebook and Twitter. Build your presence, and practice what you preach. Let potential clients know your stats, and what you can do. Show them you are already doing what they want to be doing. Devise a social media marketing plan of action that can be altered on a client by client basis. Be confident in your abilities, and if you’re not then keep learning and come back when you’re ready for that first job. Apply at every opportunity, and don’t say no to a job because it doesn’t pay enough – especially in the beginning. Network with professionals in your community. This is a great way to learn and build upon what you already know. Sometimes you might even find a social media consultant who has too many jobs and may pass a few your way. Be passionate. Your passion for marketing can be enough to get you a job. If you find social media boring, or are just trying to get rich with the next big fad, then you’re in the wrong business, my friend. Follow the social media elite – subscribe to their blogs. A good place to start is the social media section of Alltop. Subscribe to some of the blogs on there and keep abreast of the happenings in social media. There are now college courses being taught on social media, and if you want to get into the field without the college degree then you better be learning as much as you can on your own. Patrick Curl (patrickcurl.com) is a veteran social media consultant, freelance writer, blogger. His guest posts have been featured on several popular blogs. He offers businesses real solutions for maximizing social networks, and building their overall web presence from the ground up. You can also write guest articles and share your social media tips.